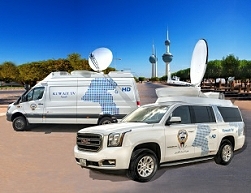 TVC supplies SNG satellite trucks to Kuwait TV. Šiauliai, Lithuania, November 2016: TVC has worked with Cogent Technologies to build two DSNG trucks for Kuwait TV to strengthen the broadcaster’s news-gathering facilities. Lithuanian systems integrator TVC in cooperation with Cogent technologies won the bid for the tender and were contracted to deliver a turnkey project that involved building two DSNG trucks for the KTV. The contract covered the design, manufacture and integration of DSNG terminals onto two vehicles, plus a complete range of engineering, training and operator support services. The two products within the “Satlinks’’ range used for these vehicles included a 1.2 metre antenna fitted on a GMC SUV 4x4 vehicle and a 1.5 metre antenna fitted on a Mercedes Sprinter 4×4 vehicle. Both vehicles were configured with fully integrated uplink chains and automatic satellite acquisition was provided via CogenTRAC control systems. Cogent Technologies, a UK-based suppliers of microwave, satellite and cellular transmission solution, worked with TVC exclusively to provide all RF uplink equipment and microwave relay equipment for the two vehicles. It supplied an ‘ExpresSat’ flyaway terminal and a large number of CogentLink 2HD link systems. Cogent solution was selected against international competition and met the stringent criteria required by Kuwait TV. The antenna is configured to automatically seek and track all major Ku-band satellites in the area. Also accommodated on the vehicle is a single thread flyaway system. This can be easily removed and deployed locally or overseas to provide flexibility of operations. In addition to the uplink equipment, we also built comprehensive monitoring facilities. Both the satellite vehicles have been cabled for future expansion. The relays can feed HD signals into the vehicles and also from the vehicles back to the studio. All the links are fully redundant CogentLink 2HD and utilise the latest transmission technology, DVT T2 COFDM modulation, allowing resilience to interference. The main challenge was to deliver the trucks in a short period of time. TVC have previously worked on similar projects in Lebanon, Qatar, Algeria and Morocco in the MENA region. TVC previous experience helped TVC in implementing this project efficiently. TVC also worked very closely with local their partner in Kuwait, Al Rashed to deliver the project in time.